Drama students at The Sixth Form College, Solihull were treated to a masterclass from second year Performing Arts students at De Montfort University this week. First and second year A level Drama students attended a workshop at the College, led by DMU senior lecturer Mark Crossley. A group of six second-year DMU Performing Arts students joined him to talk to our students about what it is like to study Performing arts at De Montfort. Two of the visiting undergraduate students were former students of this College, demonstrating a clear progression route from studying Drama at this College and a place at university. 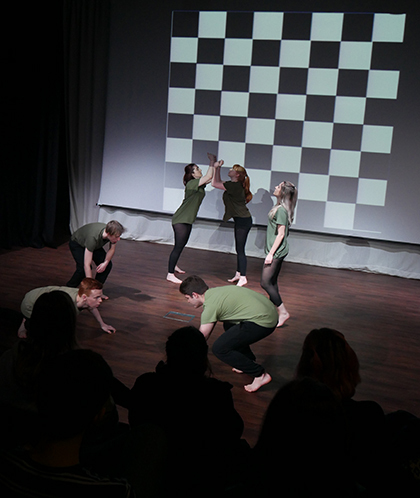 The visiting students from Leicester gave a 10-minute physical theatre performance entitled “The Iron Curtain”. This focussed on their interpretation of the fall of the Berlin Wall. They then talked to our A level students about their work, including what had inspired them to create this piece and how they went about putting it together. They explained the freedom that DMU lecturers give them with their creativity and talked about the transition from sixth form to university. Senior lecturer Mark Crossley also had some useful advice on what to look for in a Performing Arts university, how to prepare for an audition and the sort of careers these sort of degrees can lead to. Drama students are working towards their own public performances later this term. Year 12 students are putting on a showcase of their work on Thursday 14 February and Year 13 students will be doing their practical exams in March.